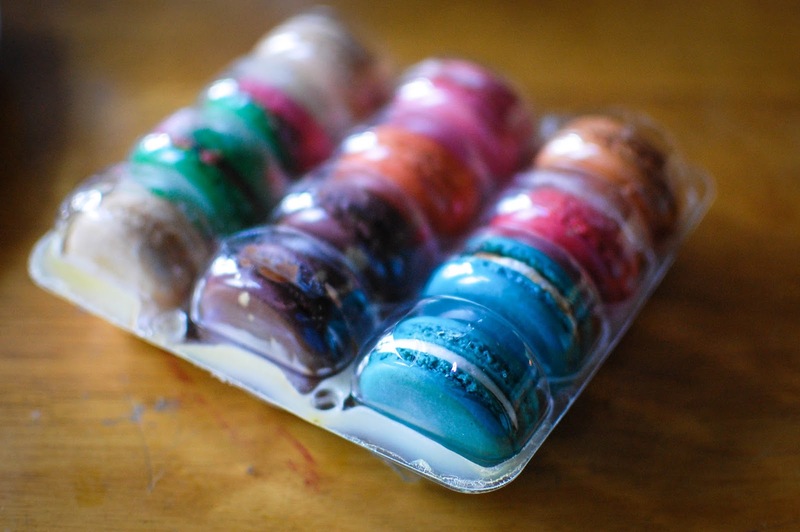 My friend, Marie, on Facebook has teased and tempted me numerous times by sharing photos of wickedly delicious macaron shots from a company called [ma-ka-rohn] and when a Fruity Pebble one popped up I fell, hook, line and sinker. I ordered will nilly, with one of those and a couple of these methodology and ended up with a baker's dozen in the end. I ordered September 26th and they arrived October 1st. They run $1.99 each and 13 were $38.37 shipped ($9.99 standard shipping plus state and county taxes due to it being a Florida company). It came in a box with an ice pack (though it was melted). 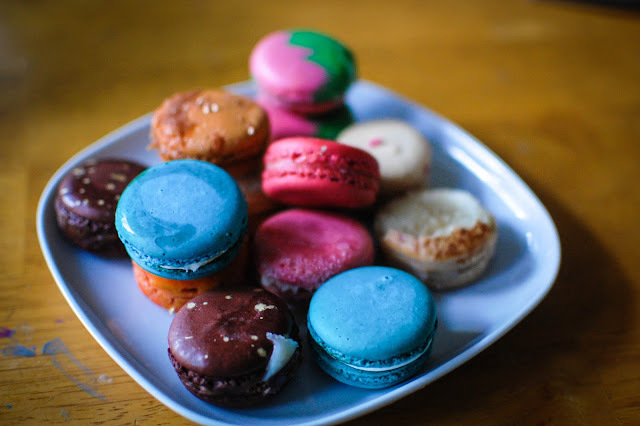 Sadly, the macarons inside were melted too. You can see the layer of melted buttercream and whatnot lining the container. I should have known better as it is really hot out but being that they are in Florida I find it hard to imagine that they don't all end up like this.... melted by the time they arrive. Some were stuck to the package and others were missing the filling but they still all tasted pretty good. That crisp outer shell was less brittle than I am used to but the flavors shone anyway. Tiramisu was top notch. Loved the coffee note. Vanilla Buttercream ended up missing filling, as it all melted out but still was flavorful even if hollow. Rose Petal held that light but lovely fragrance of rose water and sugar. Toasted Marshmallow was excellent and indeed toasted and with flame. Savanna enjoyed the Nutella one. Fruity Pebble tasted like an adult version of the cereal. Perfect. Salted Carambar contained bits of sea salt and flourished under the rich caramel center. I also picked up Strawberry & Cream, Pumpkin Spice and Birthday Cake. Saving those for later. Overall, the taste did not let me down but I am definitely not ordering these during the regular heat of Florida. Maybe only during winter but even then it will be hit or miss. They create incredible seasonal blends like Butterbeer and right now, Butterfinger. Have you tried [ma-ka-rohn] macarons? Who makes your favorite? 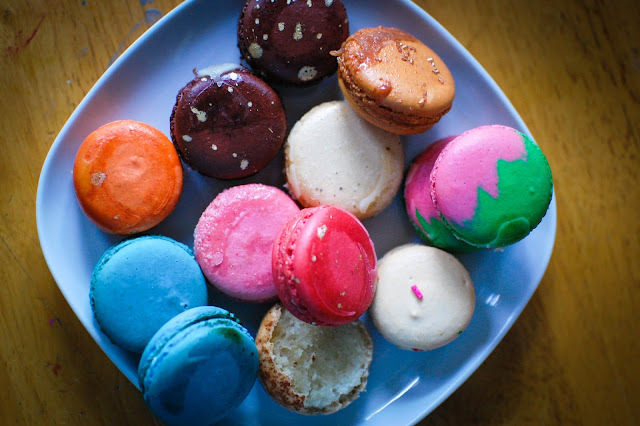 Of course, Laduree is on my list to try. Well, they're still quite beautiful, even if melted. I'm actually sort of surprised they held up as well as they did - no need telling you that Florida humidity is a year-round beast. These vloggers I follow out of Orlando subscribe to a fresh food recipe box, and one of them came completely thawed and room temperature, including the meat. I'm glad you were able to get some enjoyment out of them, even if they didn't look too pretty. The bright colors helped! 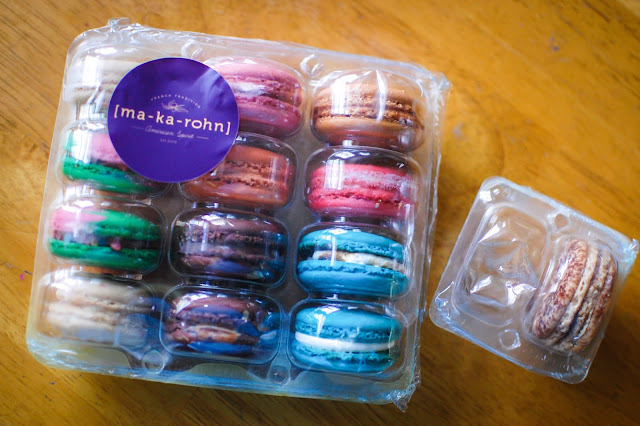 I was sketchy too about mailed macarons since they are pretty delicate, but I figured Miami isn't too far away from me. Ah well. Yes, Orlando is much closer to me though. Mailed meat always sounds like a bad idea. That is one reason why I hesitate to try Hello Fresh or Blue Apron... dang Florida heat. If they came really bad I was ready to mush them up and form them into one huge ball to eat. I have no couth. Yes! So bright and cheery! I just wished they had retained their creamy fillings and such. Definitely great flavors! If I lived farther north or it was cooler weather, I would try again for sure. The letter inside said it was normal for the ice to melt and usually it is melted. But I was hoping the filling in the cookies wouldn't be melted. Lesson learned.